I couldn't have had a better St Patrick's Day. Two wonderful morning assignments: the first one in Reston, VA, photographing the Lucky Leprechaun 5K for Potomac River Running. 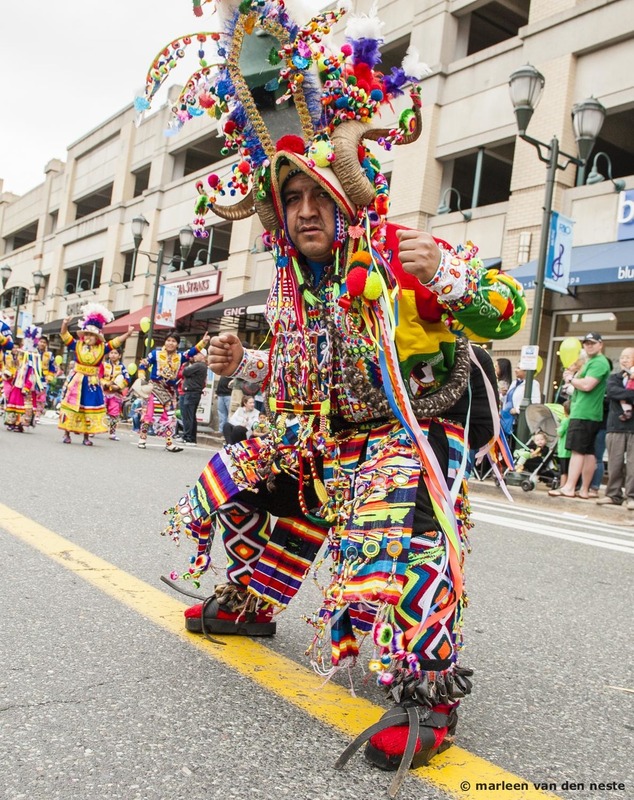 Then off to the St Patrick's Day Parade in Rio Washingtonian in Gaithersburg, MD for the City of Gaithersburg. 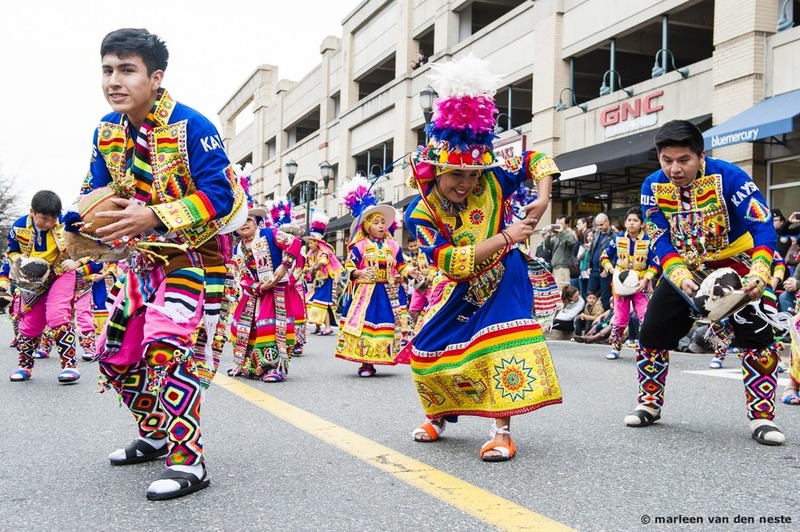 The atmosphere, the cheerfulness, the sportsmanship, the camaraderie, the spirit of the day and all the thousands of costumes/outfits were incredible. All morning I just couldn't stop smiling! Here's a small selection of photos! 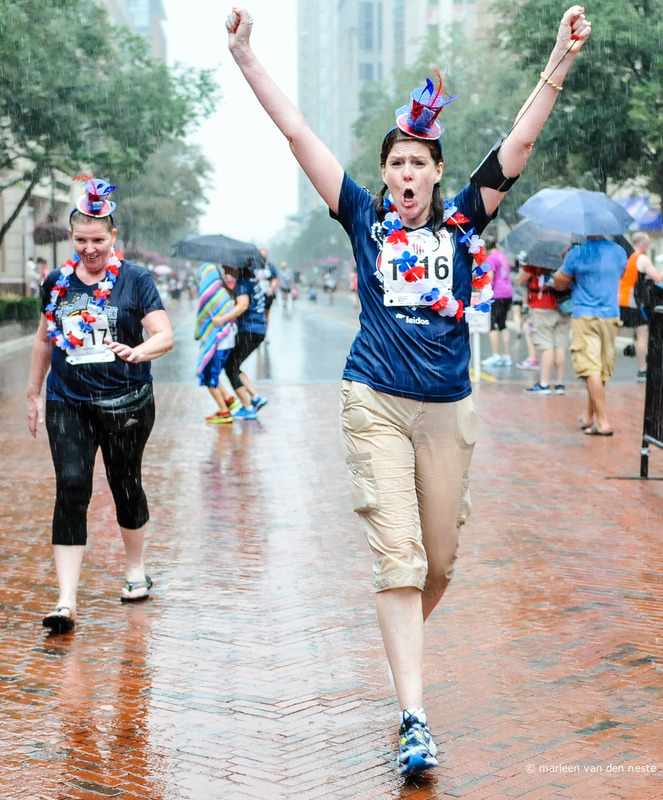 The Firecracker 5K...raining cats and dogs but still such a fun and festive (and competitive) race! July 4: the best American holiday! It embodies everything I envisioned about America and its people before I moved here from The Netherlands. 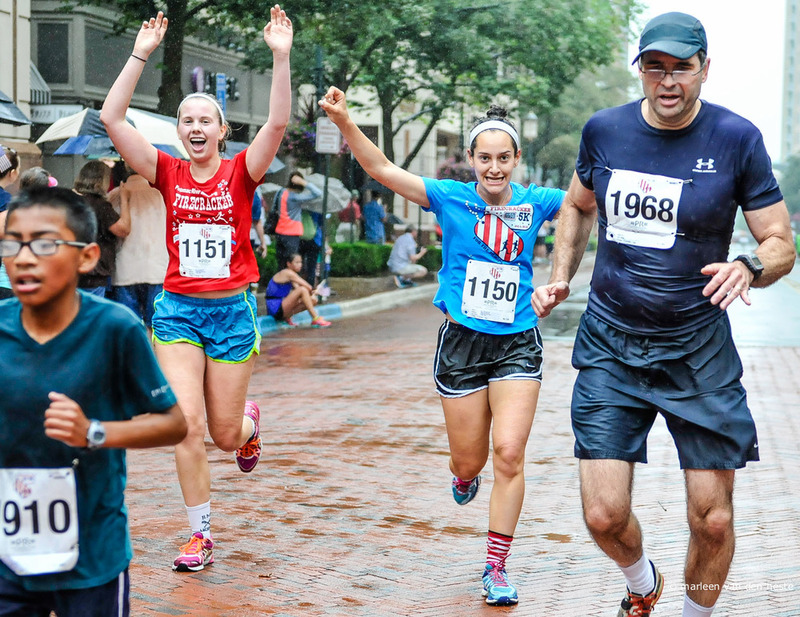 What's made it even better the past few years is photographing =PR= Races' Firecracker 5K and Fun Run in Reston, Va. 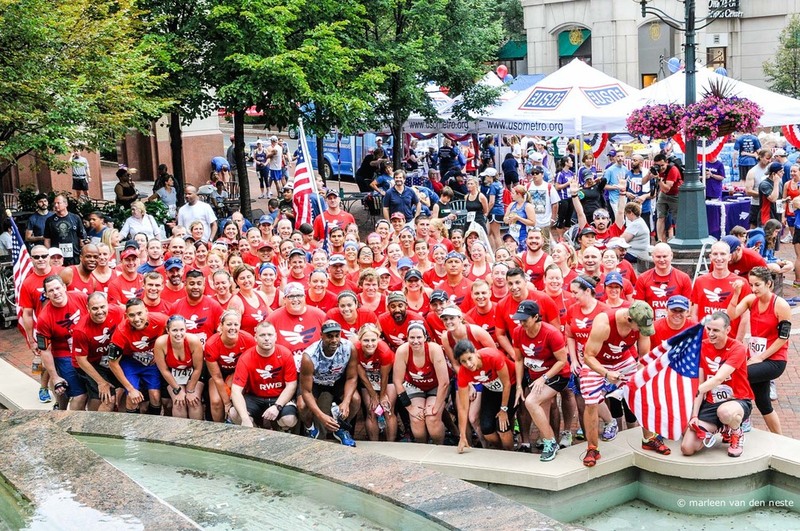 Imagine thousands of runners, dressed in the colors of the flag or sporting a similarly cheerful patriotic outfit with little or big hats, glued-on mustaches, gigantic colorful glasses, tutu's, necklaces, etc. Imagine beautiful American songs over the loudspeakers and later live charging up the athletes. 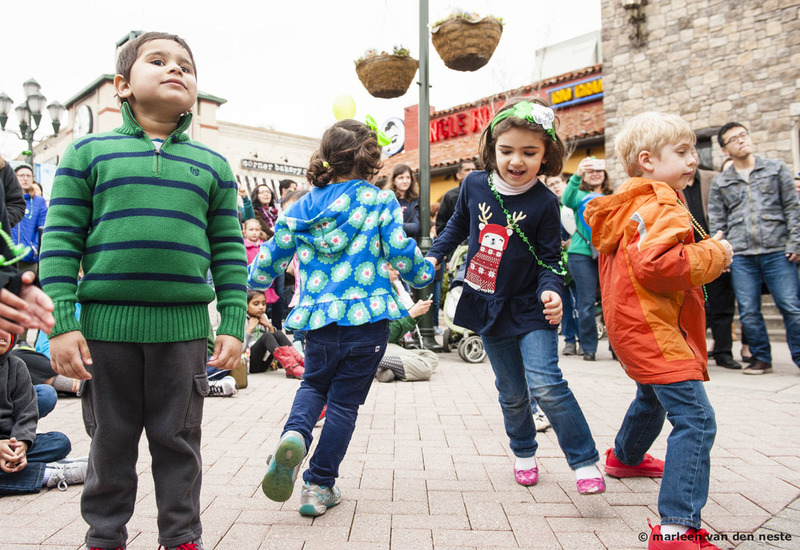 Imagine face-painting, food and lots of activities for the crowd that came out to cheer on the runners. Imagine kids and adults alike waving little american flags on short sticks. Imagine all the military groups good-naturedly participating in the "Battle of the Branches" competition. And imagine beautiful blue skies and nice warm temperatures (well: a little hot and humid maybe!). All that was true last Saturday except for the very last part! It was raining and not just a nice little summer sprinkle. It was pouring rain or in the words of the British: it was raining cats and dogs! But it didn't damper the atmosphere nor spoil the fun. Indeed, like always it was yet another fun and festive morning. My job is to photograph the runners and take some candids. When that's done I go home for the post-processing part: download to a photo software program, apply rough edits and upload to Potomac River Running's flickr account (which takes hours). When that's done I leave the photos on my computer and go about my normal Saturday routine. A few days later I go back to the photos and look at them one more time before deleting them forever. But that's never easy. I always get attached to them and I compromise by keeping just a few. I just want to show you the photos I kept from this last race. 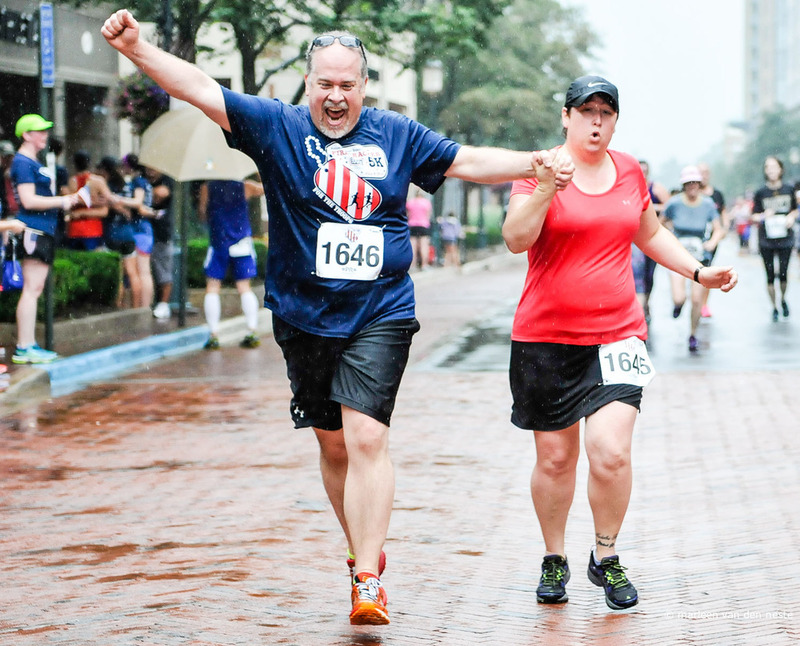 I don't have a specific explanation about this selection but I think they resemble the spirit and the gist of a typical July 4th Firecracker 5k! Road Racers: I'm talking to you and you're responding! Many Sunday mornings I rise at the crack of dawn. Sometimes I grumble a bit about that. Or I grumble about the weather: it's either too cold, too hot, too foggy, or too rainy. But once I'm in the car and find some beautiful music I'm allright and I start looking forward to being part of yet another road race and the road racing family. I photograph these races for Potomac River Running Races (=PR=Races) and I have been doing that for many years. Last Sunday I found myself in Fairfax, VA for the Rockstar 5K and Fun Run. Upon arrival I did what I usually do: walk around, get my bearings, take some candids to warm-up and mentally become part of the event. I also check in with the other photographer - my buddy Craig- and exchange stories about our latest photo shoots or talk about technical stuff or new ideas. I'm usually a little shy. But I decide to go outside of my comfort zone, grab a chair and before I know it, find myself in front and above the crowd. And I'm calling out to them: "good-morning everybody!" I'm not sure what they're thinking about this weirdo standing there but I'm not allowing myself to wonder about that and as I haven't gotten everybody's attention I'm calling out again: "Good-morning everybody. Are you guys ready to race?" And they all respond! It feels good to have made contact. I quickly lift up my camera and shoot several Hail Mary's. It's always uncertain if and how these photos come out: they might not be in focus and there will certainly be some odd angles (although I often find myself intentionally tilting my camera). But I want to capture the response. By this time I feel part of the family of runners. I feel a bond. I know that may be strange but it is really true. And I feel exhilarated and happy! What happens next is just simply amazing. They don't just respond...they respond tremendously! The following photos are a tribute to all the runners. Please look at the expressions and ignore the background. I know Potomac River Running likes its new race location in Virginia but from a photographer's point of view it's terrible: the sun is always in the wrong place and it's not very scenic. While I'm photographing I'm talking, just to myself or to the runners. I tell them that they're almost there. I tell them it's a great way to start their day and I tell them that my camera loves them. If I had more time, I'd tell them a lot more: how they inspire me, how impressed I am with them, how much I appreciate them and definitely how much I enjoy being part of their family. The joyful expression on this little girl's face -painted during post-race festivities- resembles how I feel. Yes, it's another great early sunday morning!